Please refer to our stock # 40F44 100 when inquiring. 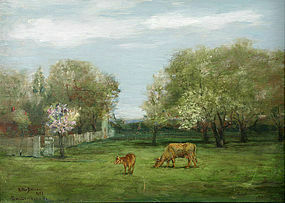 Arthur B. Wilder (American, 1857-1949) painting of Cows in a Pasture with apple trees and house. Oil on wood panel. Signed lower left, dated 1887 and titled "Bristol - Tenn. & Va." Condition: very good with a couple of light scratches in the grassy foreground. Offered in a Victorian walnut frame with gilt liner. Painting size: 16.5 inches x 22 inches. Arthur Wilder was a native of Vermont, and he developed an interest in drawing at an early age. He enrolled at the prestigious Art Students League in New York City and studied with such noted American painters as Thomas Dewing, Charles Yardley Turner and William Sartain. He also studied portraiture and figure painting with Thomas Eakins and took lessons with the tonalist Dwight Tryon. In 1897 Wilder became the manager of the Woodstock Inn, Woodstock, VT, a position that he held until his retirement in 1935. Wilder's paintings were hung on the walls of the Inn and also at the Boston Watercolor Society. Most of his paintings were of the hills and pastures in and around his beloved Woodstock. Arthur Wilder's father was hired to supervise the building of a railroad in Virginia, and, in 1886, Arthur went south to work with his father. However, the railroad venture failed before it ever started, and Arthur then began his own business venture there and opened a tourist camp hotel in Big Stone Gap, in the Appalachia region of Virginia. When this venture also failed, Arthur moved back to Vermont, in 1889, married his sweetheart and began to build a new hotel, which opened as the Woodstock Inn in 1891. This painting is an early work of Wilder, created while he was living in Virginia in 1887. The town of Bristol straddles the state border between southern Virginia and northern Tennessee and is only a short distance south of Big Stone Gap.